The launch of the Australian Government’s Sport 2030 plan, new-look national sporting body, Sport Australia, and fresh marketing and community creative platform, 'Move It', are all part of an ambitious agenda to make Australia the most active sporting nation in the world. Yet with more than half of Australians leading what’s considered a sedentary lifestyle, and sports participation expected to drop by 15 per cent over the next 18 years, it’s time to put the foot down on driving more physical activity, Minister McKenzie said. Sport 2030 has set the target of reducing physical inactivity by 15 per cent by 2030. "We're deeply committed to building partnerships to deliver on our national sporting potential," Minister McKenzie told attendees, adding it's the first national sports plan launched by an Australian Government. "Any successful venture requires teamwork." While no new dollars were announced specifically under Sport 2030, McKenzie noted the Government will spend $42 million over the next 18 months in supporting its Sporting Schools program, and is also opening up $29.7 million in community infrastructure sporting grants. In addition, the Government has announced a review of sporting integrity in Australia, a move prompted by the need to address criminal and discriminatory practices increasingly occurring within Australian sports. A study to better show the economic contribution of sport to the national economy is also being launched. And there is a significant marketing effort afoot. 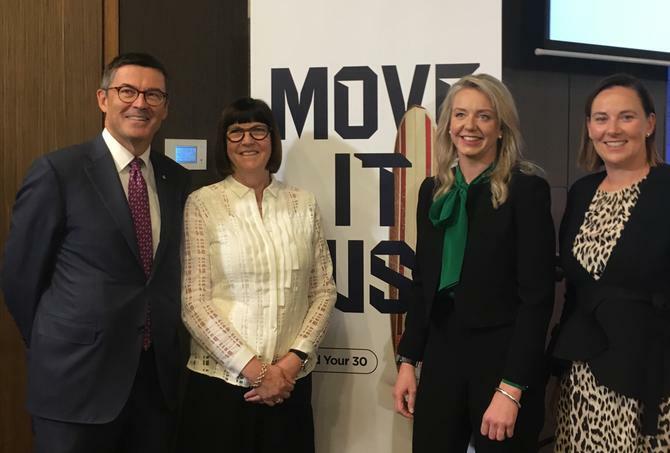 Supporting the Sport 2030 plan and launch of Sport Australia is a national brand and marketing initiative called ‘Move it’, designed to encourage more Australians to get physically active. The work is being overseen by recently appointed ASC CMO, Louise Eyres, and her team. Eyres joined the ASC last October to oversee the newly formed marketing, customer insights and analytics division, and is the first CMO to be appointed at the government body. Also recruited at the same time were general manager of corporate, Carolyn Brassil, and director, Peter Conde. ‘Move It’ officially launches from 5 August and initially involves integrated national marketing and advertising efforts encompassing TV advertising, out-of-home, cinema, digital and social. The slogan and associated creative aims to paint as extensive and cohesive a story around what physical activity can be while also highlighting the new Sport Australia brand and mission. Visually, the fresh Sport Australia (Sport Aus) branding takes its cues from the five stripes motif used by the Australian Institute of Sports (AIS), the peak high-performance sporting body, and representing the five Olympic rings. Creative agency, AJF, was brought on to build out the new brand identity as well as creative collateral. Speaking to CMO, Eyres described the ‘Move Australia’ initiative as ‘Life. Be in it’ 2.0, an iconic campaign adopted nationally in 1977 aimed at promoting more healthy lifestyles in Australia. In more recent years, however, approaches to encouraging physical activity have become highly fragmented, stretching from initiatives such as the Federal Government’s ‘Girls make your move’, to Victoria Health’s ‘This girl can’. “What we’re looking to be is the unifying idea and platform for all these activities to bring them together,” Eyres said. “Using our ambition of making Australia the most active sporting nation, we can measure and qualify that and hopefully get more of us off our couches. We now have a mandate from government to drive physical activity at a total population level. So it’s time to get more on the front foot with consumers. For instance, OOH assets around train and tram stations will suggest getting off two stops earlier than usual to walk the additional distance, while other advertising shares examples of how regular individuals as well as athletes are working to find their 30 minutes of exercise. “Initially, we’ll look to position Sport Australia and articulate the reasons why we’ve come into this movement,” Eyres said. “Then we want to show people all the ways they can ‘find their 30’ – that’s the catchcry we’re using to make this more actionable. In each case, ‘Move it’ content anchors to the idea of finding ways to be active for at least 30 minutes each day. The ‘I’ in the campaign name is also somewhat pneumonic, so whatever the sport is, consumers can start making it their own, Eyres said. There could even be a national challenge on the cards, via social media, aimed at encouraging consumers to find and log 30 minutes of exercise over set periods. This could be connected to health apps, fitness trackers and more to provide even more insights and trigger dialogue around how consumers are engaging with physical activity. “We’re trying to find every touchpoint and media to promote and advise people on how they ‘find their 30’,” Eyres said. The ultimate ambition is giving consumers a big nudge to change behaviour and become more physically active. “If we get it right, we know that in 2030 sport will continue to be a key point of national pride, our Olympic and Paralympic teams and national sporting teams will continue to achieve podium success, and our athletes and their journeys will be a source of inspiration for the next generations,” Sport Australia chair, John Wylie, said. The wide-sweeping program of work isn’t just about Sport Australia, either. Behind the scenes, the team are working to build a wealth of commercial partnerships in order to collaborate around campaign assets and content. Partners ideally stretch from retailers to media owners, insurers and local, state and national sporting codes bodies. In each case, Sport Australia hopes to adapt the ‘Find your 30’ program to suit specific sectors, brand strategies and customer bases. For example, Sport Australia could provide AFL and NFL codes with assets and packages for digital signage to run at half-time during games. Or it could work with sporting clothing and equipment retailers so they can utilise ‘Move it’ assets within their own marketing and brand activities. Collaborating playful content with media organisations, meanwhile, could encourage younger kids to get out and be physically active. To further ensure the marketing effort and Sport 2030 is as collaborative as possible, Eyres and her team have brought together marketing leaders overseeing 12 of Australia’s biggest sporting codes including basketball, AFL, cricket, swimming, surfing and tennis, into a cross-code advisory group. Historically often seen as competitors, this working group, dubbed the ‘Marketing 12’, is about fostering more engagement with physical activity as a whole, she said. What’s clear is certain sporting codes have a stronger presence in different customer segments as well as channels. Gymnastics, for instance, has a strong footprint in the youth market, while surfing has a wider participation age group and strong digital following. “Yet we’re all after the same customer and trying to encourage movement,” Eyres said. By building a shared agenda that can incorporate data, insights and strategy, the Marketing 12 can improve engagement in sports and encourage physical exercise as a whole. One of the ways codes could work better together, for instance, is by opening up data sets to explore hypotheses that help broaden understanding of audiences and the pipeline of people involved in sports. Not surprisingly, such wide-reaching plans have triggered a complete restructure of Sport Australia’s marketing and insights teams. Recent hires include Wing Cheung, ANZ’s former customer insights and digital strategy lead, to deputy general manager of digital strategy and insights; former Defence Jobs Australia national marketing manager, Fiona Boughton, as deputy GM of marketing; and former Mattel brand leader, Tracey Hutson, as director of brand strategy and experience. The ambition is to have a corporate marketing team driving media, social and content. Alongside this is a team focused on AIS and the high-performance part of the market, then a participation marketing unit emphasising third-party partnerships and with expertise in consumer marketing. Ultimately, Eyres described her change agenda as CMO as making Australia the world’s most active nation, full stop.